Can I admit that Bygones sat on my shelf for six months. I wanted to read it, but I was afraid I would be unable to get into a story about the collision of old and new with the Mennonite thread. Yet from the moment I picked up this book till I finished it the next day, I could not get away from this story. The characters and plot were amazingly gripping. Marie Quinn left Sommerfield, Kansas, twenty years ago and will never return. She was disowned by her family when she married a non-Mennonite and has made the best life possible for her daughter. Then her world is turned upside down when an old friend enters the cafe where she works to tell her that her great-aunt died. Later he informs Marie and her daughter Beth that the great-aunt left everything to Beth on one condition -- that she live in Sommerfield for three months. Beth talks Marie into going with her, and Marie steps into a pit of pain. The story weaves through the broken relationships from Marie's past, the dreams of her daughter's future, and the healing of old hurts. The story is on some levels simple, but also gut-wrenching as Marie searches for the acceptance and love that has been denied to her for twenty years. Just when she begins to make inroads, events begin to happen which cast suspicion on her and Beth. Even after she returns to her faith, it looks like she won’t get the desire of her heart. I could relate to the uncertainty and fear that plagued Marie. And also to some of the poor choices she makes at the end of the book in an effort to protect her daughter. This book is real with characters that I could relate to. From Henry who has loved Marie for years, to her father whose stubbornness may undo him, to Beth who can’t wait to get out of town. And the clash of Mennonite expectations with the 21st Century made me long for that simplicity – though I do like my electricity, thank you very much. This is a book that will touch you long after you’ve stopped reading it, whether you’re the prodigal longing to come home or on the other side waiting to see if the prodigal is truly changed. 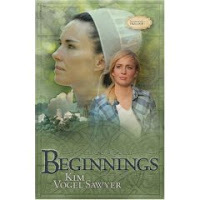 Beginnings is book two in Kim Sawyer's Sommerfield Trilogy. Having breezed through Bygones, I fully expected to love Beginnings. Kim did not disappoint. This book focuses on Beth Quinn and her deep desire to find a place to belong. She wants to be near her mother who has embraced her old life with the Mennonites. Yet, Beth, while a young believer, has no desire to join the Order. As long as she remains in Sommerfield, she feels like an outsider. This story tells the poignant journey Beth makes as she tries to find herself and establish her business. The stress of starting a successful stained glass shop could push her over the edge. Then there are the two men who are suddenly vying for her attention. Or are they vying for control of the business. Because of what happened in her relationship in the first book, she finds it hard to trust again. Kim does a magnificent job painting the setting and characters that I care deeply about. When I pick up one of her books I fully expect to be swept into the story and characters' lives. She has never disappointed me. And the spiritual journeys of the characters are richly worded and woven into the very fabric of the story. I never feel like she's preaching at me, yet the seeds she plants stay with me long after I've closed the book. Beth's journey is not an easy one, and she makes mistakes along the way. I could so relate to that. Yet at the same time, her epiphany moment is a natural outgrowth of the progression of the book. This book will join my keeper shelf.